Of all the many throwdowns, smackdowns and showdowns I’ve attended and judged (including the one ill-fated smackdown that I organized), this past Monday’s was the best one yet, both in terms of accumulated talent and organization. And although there were some folks in attendance that I could have done without seeing and frankly wish would leave Houston altogether (is that negativity? or just honesty? sometimes it’s hard to tell…), I had a wonderful time. And although I really enjoyed judging the first Houston Chowhounds throwdown (Monday night’s was the fourth) — which meant all the fried chicken I could possibly eat and then some — the thing I enjoy most about these get-togethers is snapping photos. Hope you enjoy some of my favorites below. Carlos Rodriguez of Vic & Anthony's may be a jerk, but he plates a mean dish. The team from Brenner's was like a mad symphony working the line. 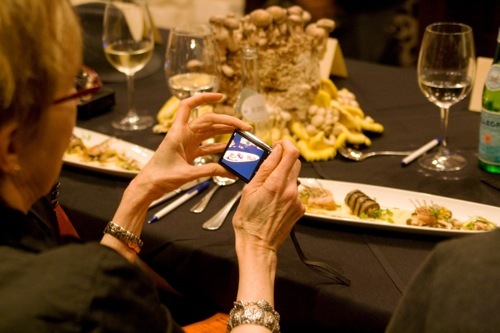 Patricia Sharpe of Texas Monthly took photos of all the dishes she judged. Exciting news from the Randy Rucker camp: the former chef/owner of laidback manor and the genius behind tenacity is now the executive chef at Rainbow Lodge! Rainbow Lodge holds a special place in my heart, as it’s where my mother and stepfather were married back in 1991. The restaurant and its grounds are absolutely gorgeous, the 100-year-old log cabin that serves as the main restaurant evoking a warm, sanguine, lodge-like feeling despite being right in the middle of Houston. Their motto of “sophisticated but not stuffy” couldn’t be more perfectly paired with Randy’s own brand of cuisine. The dinner will also feature the debut of his own version of the Savoy Truffle, which I recently wrote about in Houstonist. This is wonderful news, indeed. Make sure you drop by Randy’s page and congratulate him! Houston needs more chefs like him, and I’m glad that Rainbow Lodge has offered Randy a home. Here’s to a successful pairing and a long, happy partnership! There isn’t much more left to say about Feast that hasn’t already been said. 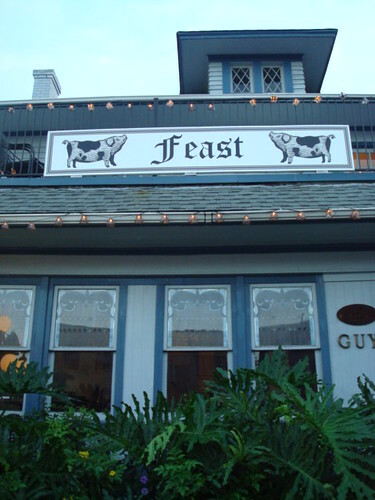 A restaurant like Feast wouldn’t seem to mesh well with the Houston dining scene upon only a cursory glance: strange items like pork cheek and dandelion green salad, black pudding and whole breaded pig’s trotter dot the menu. Mostly, these are items that the average Houston diner has never eaten, much less encountered on any menu, anywhere. But upon closer consideration, this is exactly the kind of comfort food upon which this city thrives. It’s rustic, unpretentious, hearty fare that your grandmother would have made if only she’d been slightly more adventurous, English, and been trained up by Fergus Henderson. What could be more inviting on a crisp October night than a bowl of oxtails with carrots and mashed potatoes? Or a velvety dish of lamb shanks with roasted potatoes and kale? This is truly comfort food taken to the next level. 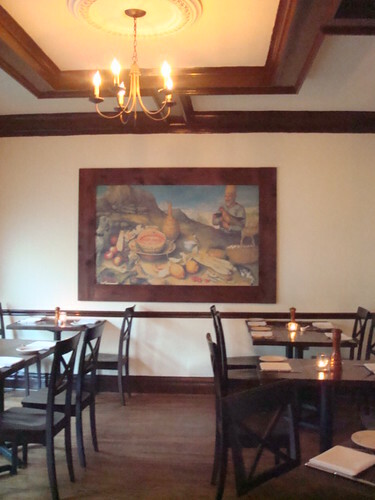 The dining room, too, is just as inviting, with simple wooden tables and chairs under a low-slung beamed ceiling. A fireplace filled with candles give off a warm glow equalled only by the warm greeting you get when entering Feast. Walk up the pleasantly creaky stairs to the second floor and out onto the balcony, where you’ll be surprised to find an amazing view of not only Montrose, but also the twinkling skyline of downtown Houston, which seems close enough to touch. 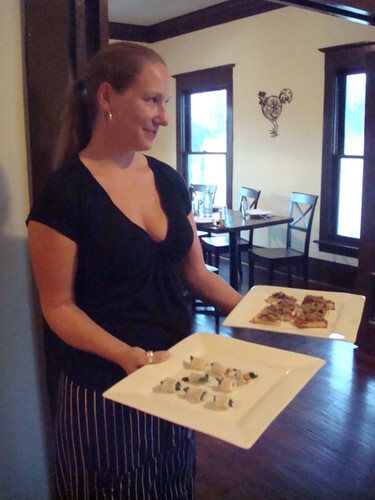 The appetizers on hand this past Friday night were decadent: back fat (yes, the menu says “back fat”) wrapped around walnuts and parsley, grilled sweetbreads, chicken liver pate with cornichons and my favorite of the night, Welsh rarebit. The pork back fat was so completely antagonistic, but I couldn’t stop eating it. You know deep in that rational part of your mind that you don’t need to be popping pieces of white, dimpled fat into your mouth like Skittles, but the fat was so luscious and had just the right amount of give without being too spongy or chewy. The hard bite of the salty walnut in the middle was the perfect accompaniment. The Welsh rarebit, too, was heavenly: a thick spread of savory cheese sauce over a piece of toast drenched with Worcester sauce. Perhaps the bite of the Worcester sauce was too tangy for some, but I loved the way it complemented the velvety cheese with its sharp aftershock. Soon, we moved on to the first courses: scallops baked with a cream mushroom sauce and the aforementioned pork cheek salad with dandelion greens, roasted shallots and garlic. The pork cheeks were redolent with fat and glistened up at us from the bed of bitter greens, mixed in with a few croutons that had been similarly soaked in pork fat. Perhaps this would be a good time to mention that if you don’t like pork, or pork fat, Feast might not be the best place for you. The scallops were good, but had nothing on the salad. I ate so much of the salad that I feared I’d ruined my appetite for dinner. The pork cheeks reminded me ever so slightly of the piping hot, fresh chicharrones that you can get from the old school Mexican markets around town. You know the ones: grab a bag and eat them with a dab of hot sauce while you do your shopping and they’re gone before you know it. Each bite of the salad was different, never knowing exactly what combination of textures you’d get from one to the next. 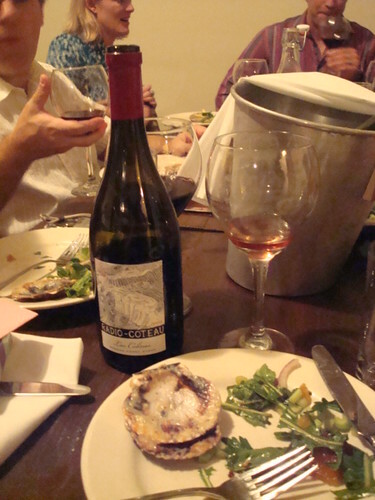 Peg had brought a lovely Radio-Couteau shiraz to share with us, and its heady, smoky smell drifted pleasantly over the table as we eagerly awaited our next course: the pigs. James Silk, butcher-chef extraordinaire and co-owner of Feast, brought along his sous chef to carve the beautiful suckling pigs that Peg had requested for her birthday feast. They were small, delicate things yet the aroma was intoxicating. 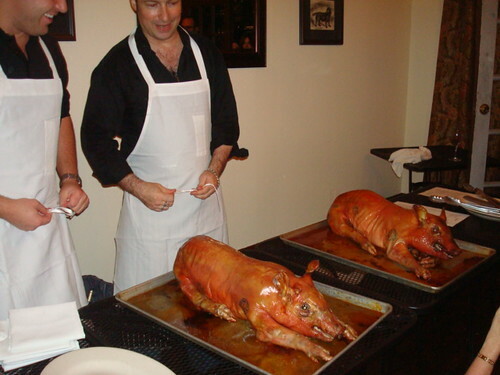 Inside the roasted pigs was a traditional sage and onion stuffing, which made your mouth water and your mind wander fondly to holiday meals past. 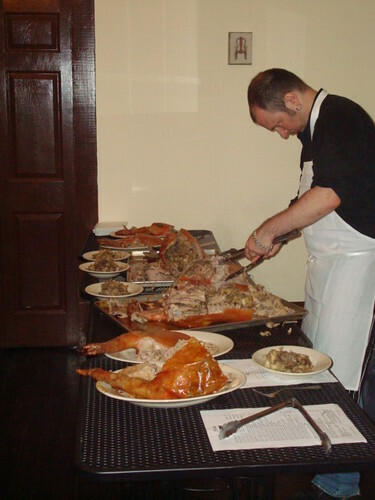 James made quick work of the piglets, as he plated the trotters, the stuffing and the delicate loins. Some of us couldn’t wait, however, and absconded with one of the heads. 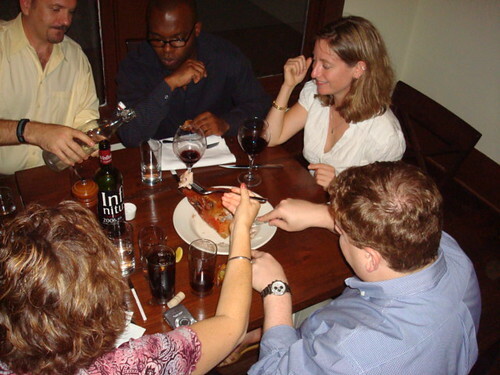 Soon, a group had formed around the head, as it was dismantled for the fresh cheeks, chin, ears and other savory parts. As we passed around the platters of roasted pork and stuffing, the side dishes were brought out. Steamed carrots, roasted Brussels sprouts, dusky kale with anchovies and melt-in-your-mouth mashed potatoes, which tasted as if they’d been made with equal parts potatos and heavy cream. All of the sides were outstanding, especially the Brussels sprouts, which are so rarely made well. These were roasted quite simply and still had a slightly crunchy bite to them. The lamb was a late but welcomed arrival to the table. As we tasted our first bites, there was a general confusion over the slightly sweet melange of spices used to prepare it. Joanne finally asked James when none of us could figure it out, and we were surprised to hear that it was a combination of mace and juniper. The mace is a throwback to traditional English recipes of yore, but tasted fresh and new when used here with the juniper. By this time, the clock had long since struck 10pm, but we weren’t going anywhere. Peg had obtained some ice wine during her latest trip to Canada that not only scored a perfect 100/100 in a recent tasting but is also entirely unavailable in the States, and Feast had graciously agreed to create a dessert to pair with it. 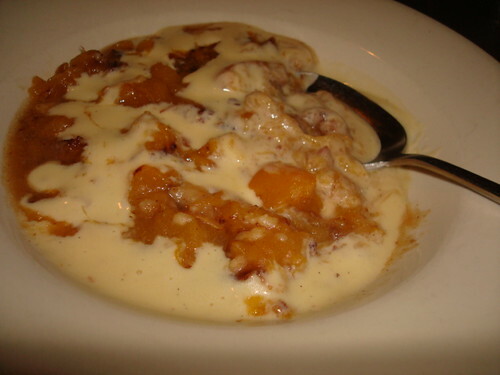 Their creation, a divine apricot and date crumble, appeared at the table in warm dishes alongside a jug of thick, creamy custard. 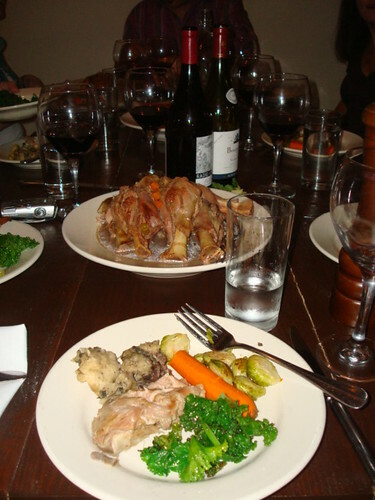 The room fell mostly silent as we ate, a combination of exhaustion after our long feast and the warm crumble filling our mouths and bellies, keeping our tongues busy with more important activities than talking. I’ll be making a return trip to Feast very soon, as James has promised a steak and kidney pudding — a dish which, owing to its suet pastry, is exceedingly difficult to find in the States — if I give him a few days advance notice. It’s a dish that fits Feast nicely: the most rustic of food, made with bits and pieces that are in keeping with the “nose-to-tail” mantra of the restaurant. 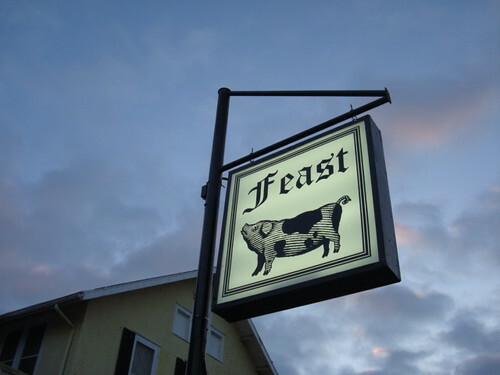 But even if there weren’t promises of the tantalizing dish, I would still be returning to Feast again and again and again. Medieval writers and religious figures took a very broad view on gluttony, arguing that the sin encompassed more than simply over-indulgence in food and beverage. Thomas Aquinas went so far as to prepare a list of six additional ways one could commit gluttony while consuming a meal. What were three of these ways? Gluttony isn’t the only deadly sin that relates to food. Avarice, or greed, is responsible for driving up the cost of food items worldwide as investors and commodities traders profit from the abject poverty and hunger in countries like the Phillipines, Honduras and Bangladesh. Since 2000, the worldwide price of various oils and fats has risen by 300%, the price of milk by over 150%. By how much has the price of grains gone up since 2000? Throughout history, people have sought aphrodesiacs to increase their own virility or induce lust in the object of their affections. 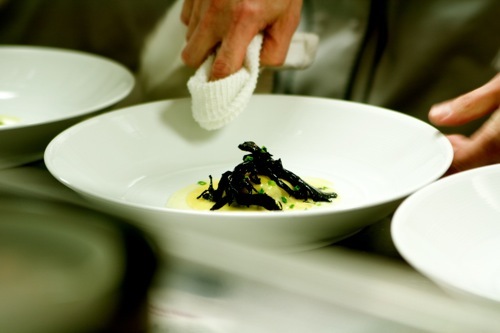 Which of these foods is not traditionally considered an aphrodesiac: balut, arugula, ginseng, kelp or abalone? People go to war for many things: religion, land, natural resources. Food (and famine) has been one of the main causes of wrath and wars throughout human history. In fact, most anthropologists now believe that the population of what mysterious island was wiped out after a civil war over food (or, rather, a lack thereof)? BONUS: Sloth has created a nation (and a world) obsessed with fat-and-calorie-laden fast food and pre-packaged meals. What creation has been widely dubbed the “worst fast food burger” in America, nutritionally-speaking? Now, obviously, the theme this week was…the Seven Deadly Sins. And the reason for that is two-fold. The first reason is that this week’s prize is one of my all-time favorite food anthropology books, In the Devil’s Garden: A Sinful History of Forbidden Food. Today’s trivia winner will receive a copy of this truly fascinating book, shipped directly to their front door. I promise that none of today’s questions come from the book, either, so you’re guaranteed a fresh, interesting, eye-opening look at food taboos and food history as it relates to the Western concept of the Seven Deadly Sins. 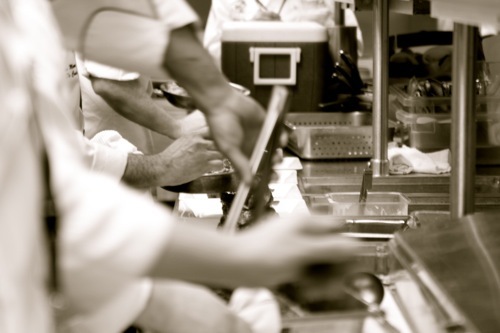 The second reason is that Randy Rucker will be holding his highly-anticipated Seven Deadly Sins dinner this Monday, October 20th, at Culinaire Catering on Milam. 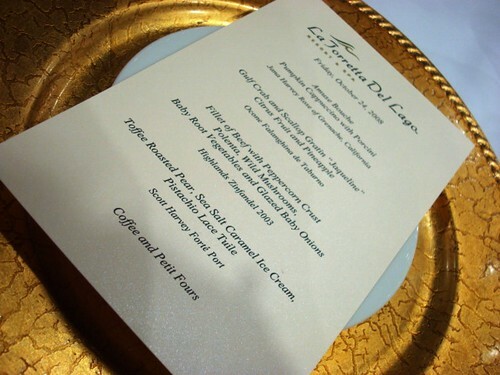 The menu for the night includes seven courses, one for each sin. You don’t want to miss this special tenacity dinner. As always, you can email Randy at rrucker79 at hotmail dot com to RSVP for the dinner. Do it soon! Spots are filling up fast for this one. Answers (and this week’s winner! — I’m very excited about this!!!) will be announced tomorrow afternoon, so hurry up and get those guesses in before anyone else comes in to crib off you! See you all back here on Friday, bluebirds!